Kettering Town manager Marcus Law takes his side to third-placed Redditch tonight hoping they can set a platform for the rest of their season. With a tough Monday night away trip followed on Saturday by a journey to strugglers Cambridge City, Law is keen for his team to set themselves up for the season’s run-in. 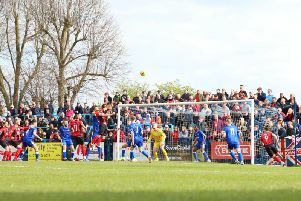 After their double away day, they then have a run of seven straight home games in a period the Poppies boss feels can really push them into the play-off places. Having only lost twice at Latimer Park all season, he might well have a point. But he insists they need to make sure they get some reward from their travels if they are to be in contention. “We need to go to Redditch and then Cambridge and get something from those games,” Law said. “If we can do that, we put ourselves in a really good position to challenge for the play-offs. “After two away games we have a good home run and, given our record there, we would fancy putting something together. Application was something Law was questioning after Kettering’s 4-3 win over Cirencester at the weekend. Goals from Brett Solkhon, Rene Howe and Ben Stephens put them 3-0 up and cruising before a collapse saw the visitors drag the game back to 3-3 courtesy of a Charlie Griffin hat-trick. It needed an 88th-minute winner from Wilson Carvalho to save their blushes. It might have been entertaining fare for the supporters, but it is the sort of match that would have a manager pulling their hair out. “If ever a game typified our season then that was it,” Law explained. “It was everything we have done over the whole campaign crammed into 90 minutes. “We were excellent at times and created some great chances. “We were totally in control and the opposition were not looking like doing anything. “But then the defensive display was truly inept and we allowed them back into the game. “It then looks like the match has gone only for us to take it 4-3. “The application of the lads was not what it should have been for the situation of the game and that is worrying. “There are certainly things we need to work on and they are areas that the senior, experienced players should be sorting out. “The positive thing is that we’re at the business end of the season and we got another three points.